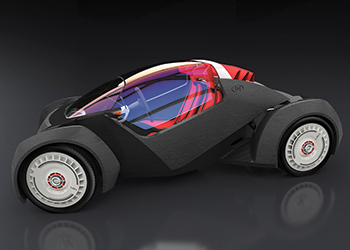 Sabic delivered the innovative materials and processing expertise needed to create a first-of-its-kind concept vehicle using advanced 3D printing (also known as additive manufacturing) during the International Manufacturing Technology Show (IMTS) in Chicago. This fully functional vehicle being printed from scratch and assembled by automotive design firm Local Motors. "When the team was choosing our partners to produce the world’s first 3D-printed car, Sabic was an obvious choice because they would quickly and reliably deliver the proper materials needed to bring the Strati to life," says John B Rogers, Local Motors CEO. Sabic’s LNP STAT-KON carbon fibre-reinforced compound was chosen for its excellent strength-to-weight ratio and high stiffness, which minimises warping during the 3D printing process, enabling enhanced aesthetics and performance. Additionally, Sabic’s expertise in this emerging technology, including material selection and validation, equipment specification and processing, were instrumental throughout the development process. "Involving Sabic at the inception, with their experience in advanced processing technology and material validation, was critical to the project’s success," says Andrew Jamison, CEO for Cincinnati. "Visitors got a first-hand look at the future of additive manufacturing and its possibilities to transform the industry with our Big Area Additive Manufacturing (BAAM) machine running Sabic material and printing polymer components 200-500 times faster and 10 times larger than today’s additive manufacturing machines." Tony Cerruti, marketing director, Americas, for Sabic’s Innovative Plastics business comments: "Sabic’s materials and processing knowledge together with this advanced additive manufacturing technology will help to address the manufacturing challenges our customers are facing – the high cost to innovate. We believe that this technology has far-reaching potential for applications across the multiple industries that Sabic serves, bringing designs to market faster and enabling mass customisation."